Freckles occur in areas of your skin where there is an excessive amount of concentrated melanin (skin pigment). 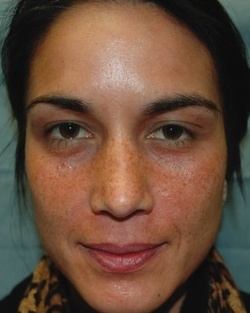 These darkened hyperpigmented lesions are most often noticeable in people with a fair complexion (Fitzpatrick Classification I and II). Other names for freckles are ephelis, speckle, fleck, dot, spot, mole, blotch and macula. Freckles are predominantly found on areas of your skin that are frequently exposed to the sun. These susceptible locations include your face, arms, and shoulders. Since freckling occurs largely as a result of sun exposure, they tend to increase as you age. Therefore, freckles are rare in infants and young children. Freckles can lighten and darken depending on how much sun exposure you have and whether or not you have used some sort of skin lightening agent.